She was the last girl you'd ever see in a bar. Okay, okay, I admit it. I am a sucker for sweet, genuine love stories that involve musicians. I don't care if it is a rocker like Kellan Kyle or a country music singer like Lucky in this book, I fall so hard for them! 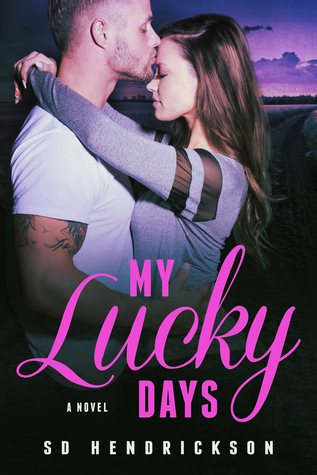 My Lucky Days is especially heartwarming for me because every chapter has a song reference at the top and being the huge country music fan that I am, it was such a wonderful touch. The book has it's own playlist for every chapter. The heroine of the book, Katie, is such a wonderful character. I adored her personality and the way she is fiercely independent. She is selfless to a fault. As a college senior she is level-headed and smart. Even though she came from a family with money, the one thing she never had was a home. One evening she has a chance encounter with an up and coming country music singer and her life is forever changed. Meet Landon "Lucky" Evans. Lucky is one of the best characters I have read in a long time. He is sweet, attentive and can make a girl swoon with a single text message. I adore his back story and the fact that he loves with every fiber of his being. Of course the guitar playing and singing don't hurt his case either! I already knew that S.D. Hendrickson is an amazing author. I fell in love with her writing style and story telling ability when I opened The Mason List, so I had extremely high hopes for My Lucky Days. I was floored by my love for My Lucky Days. All of the characters had such wonderful personalities and I felt a true connection to them and their story. You will laugh and cry in this story. While it is somewhat predictable, it is so well written that I did not mind that at all. Well done, S.D. !